Today, with the help of Egypt’s armed forces and the tourism and antiquities police, five artefactes from 42 objects missing from the Egyptian Museum were recovered. 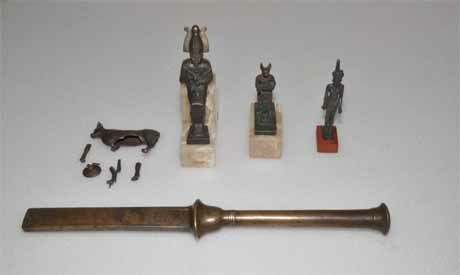 The five items include four bronze objects depicting different ancient Egyptian deities, such as Osiris, the cat goddess Bastet, Abis Bull and Neith. All the returned objects are in good condition except the Abis Bull, which was broken into several pieces. With restoration, archaeologists hope, it can be restored to its original form. Egyptian Museum Director Tarek El-Awadi believes that the remaining 37 objects remain in Egypt and have not been smuggled out of the country. When the museum recovers the last missing object, an exhibition relating the story of the January break-in during Egypt’s revolution will be on display as well as all the retrieved objects. “I am really very grateful as the police and armed forces are exerting all efforts to return Egypt’s missing heritage,” said Mohamed Abdel Fatah, also of the museum, wishing that all the missing objects will be returned soon.